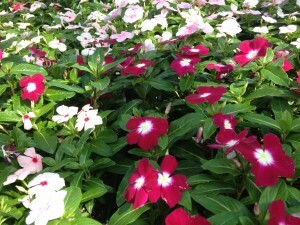 The Heat Is On…These Annuals Can Take It! 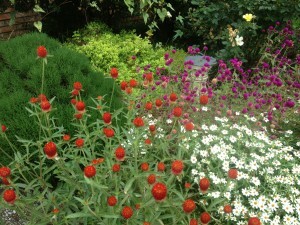 Gomphrena, zinnias, red cuphea, mexican heather, vinca…have you tried one or more of these in your garden or planters? If you haven’t, you should! Gomphrena is one that you might not look at twice in its little pot on a table at a nursery…but it is one of the toughest plants – and the prettiest, come the dog days of August. In fact, the heat seems to bring on more blooms, and the more sun the better. It is more difficult to find, but we have gotten some in recently. The taller varieties are particularly nice in the garden, and they come in purple, red and sometimes pink and white. If you have a tough, hard to deal with spot in your garden, gomphrena is one to try. Red cuphea, or batface cuphea, is another underused but tough plant for our summer heat. 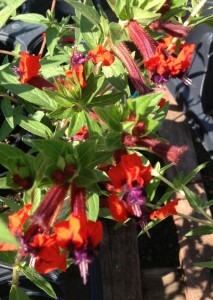 If you’ve ever noticed the bright red blooms in our sign planter at the shop in the middle of summer, you’ve seen bat face cuphea in all its glory. While butterflies flutter and land on the gomphrena, you’ll see the hummingbirds feeding on the cuphea – they love it! With its trailing habit, it works quite well in planters. Zinnias are another go-to flower that can’t be beat – the best for disease resistance (no ugly leaves) are the narrow leaf zinnias, the Profusion and Zahara zinnias. 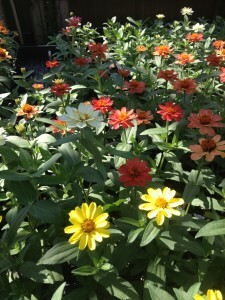 You’ll find narrowleaf zinnias in yellow, white, orange and a mix of these three colors. Both Profusion and Zahara types have larger bloom and come in some pink colors too. Finally, vinca is one of the most drought tolerant and forgiving plants out there…in fact, overwatering is the main culprit if plants don’t make it – how great is that? The clear, pretty colors of vinca and both upright and trailing habits make them the perfect candidate for beds and planters alike. So, it’s the middle of summer and you say you need a little color? These are the annuals that can take the heat! This entry was posted in Annuals, Bedding Plants, Summer and tagged annuals for heat, annuals for sun, bat face cuphea, cuphea, gomphrena, heat loving plants, vinca, zinnias on May 31, 2013 by Kris Blevons.